The new PotashCorp Rocanville shaft as Scissors Creek is being taken into account for potash tax sharing for the first time this year. The shaded areas on this map show the 10-mile and 20-mile radiuses that were used for potash tax sharing until last year. This year the Scissors Creek shaft will be included, extending the radiuses farther west and south, so that the RM of Silverwood and the town of Wapella will receive potash tax for the first time. Some communities will see big increases in potash tax sharing revenue this year, according to the Potash Tax Sharing Board. The changes come about because of a higher assessment for potash mines at Esterhazy and Rocanville, and a higher mill rate. The Potash Tax Sharing Board collects taxes from the two mines and distributes them to towns, villages and RMs in the region. The taxes are shared based on a complicated formula involving the distance from potash mines, local mill rates, and population in each municipality. Because of the new shaft at PotashCorp Rocanville, the town of Wapella and the RM of Silverwood will receive potash tax sharing payments for the first time in 2016, while the RM of Spy Hill and towns and RMs farther north, along Highway 16, will see a reduction. The Potash Tax Sharing Board distributed $7,399,406 in 2015, and expects to distribute 8.9 per cent more—$8,059,736—this year. The big winner in the redistribution is the RM of Rocanville. The RM received $1,470,248 in potash tax in 2015 and is expected to receive $2,099,935 this year, an increase of $629,687 or 42.8 per cent. The RM of Rocanville, in which the three shafts of PotashCorp Rocanville are located, will become the biggest recipient of potash tax in the Rocanville-Esterhazy area. 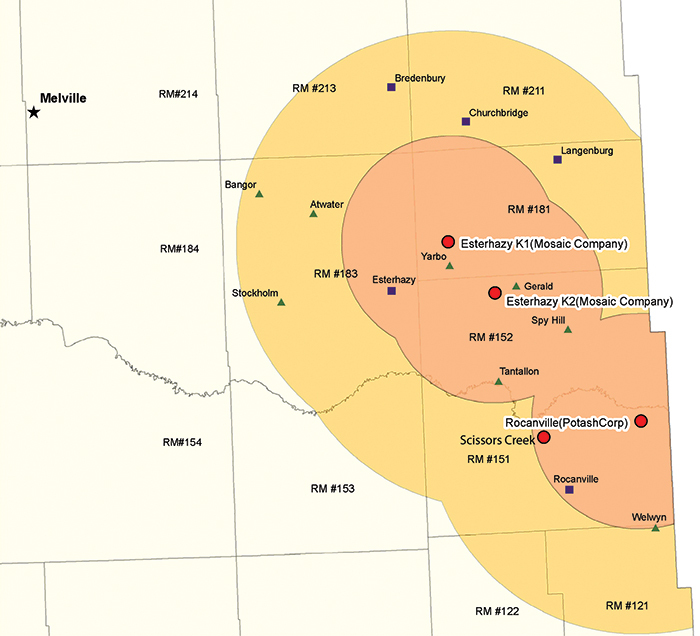 In the past, the RM of Spy Hill was the largest recipient, because it is home to one of the Mosaic shafts and is very close to the two original PotashCorp Rocanville shafts. Because of the location of the new PotashCorp Rocanville shaft, the RM of Spy Hill will receive less this year, $1,835,005, down from $1,966,551.75 in 2015, a reduction of 6.7 per cent. The RM of Martin received $66,345 last year and will receive $202,129 this year, an increase of $135,784 or 204 per cent. The RM of Moosomin received $209,944 last year and is expected to receive $220,493 this year. The RM of Silverwood has not received potash tax sharing before, but this year is expected to receive $111,826. The town of Wapella has not received potash tax sharing before but this year is expected to receive $17,042. The town of Rocanville received $164,458 last year and is expected to receive $175,443 this year. RM of Rocanville Reeve Murray Reid said he welcomes the increase, but notes that potash is the only industry in which the municipal tax generated by a plant does not stay with the municipality in which the plant is located, but is shared with surrounding municipalities. He said the extra revenue from potash tax sharing this year is welcome, but the RM of Rocanville has a lot of expenses related to the potash mine that other municipalities do not have. “We’ll have a home for all that money. We have two and a half miles of heavy haul road—that access into Scissors Creek. We tried to get the government to take that on but they won’t take it on. At every other mine they have a provincial highway running in there, but we are responsible for repairing that road into Scissors Creek. Reid says the RM of Rocanville is fortunate to have the potash mine. “We’re the fourth highest assessed municipality in the province,” he points out. “We’re very fortunate to have that money coming in. We can put money into recreation, and put money into a new hall. RM of Silverwood reeve Bill MacPherson said news of the windfall revenue came as a surprise. “We just had our meeting and we got this letter saying we’re getting $111,000 and I said ‘whoa!,’ ” he said in an interview Thursday. “That was a surprise. We had no indication this was coming. With the new Scissors Creek mine, some of our RM fell in the radius, so we’re getting some money. That is certainly good news for us—we have places to put it. “There are enough Scottish guys on council that we never turn down money,” he said with a laugh. MacPherson said the $111,000 is significant in relation to the RM’s total budget. He said the RM has lots of expenses to put the funding toward. “Any RM or town always has lots of expenses,” he said.